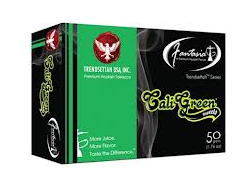 Fantasia Trendsettah Cali Green Sweets | HookahRev.com | Hookah, Simplified. It's interesting. Anise taste broken up by (all too short) tastes of natural bitter apple, like a granny smith. I have to harp on the name, some people who smoke this may not like double apple, and the name is incredibly misleading to that. The green apple tastes are quite nice, but far too infrequent.